— This article by Jerry Cates, first published on 11 March 2010, was last revised on 18 April 2016. © Bugsinthenews Vol. 11:03(14). 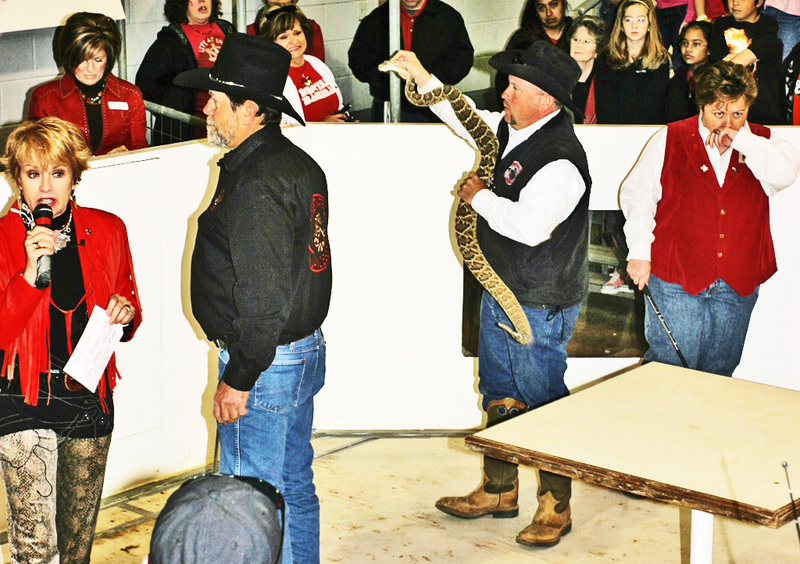 March 11, 2010: The 52nd Annual Sweetwater, Texas, Rattlesnake Roundup is off and running, and BugsInTheNews is there. I arrived in Sweetwater last night, and spent the day touring the grounds at the Nolan County Coliseum, meeting a huge number of really nice people from all over the world, and checking out some of the finest BBQ rigs found anywhere on Planet Earth. I even became acquainted — albeit informally, and in the immediate aftermath of a roaring kitchen fire that had threatened to destroy the Jaycee BBQ cook shed — with Terry Armstrong, president of the Sweetwater Jaycees, hosts of the Sweetwater Rattlesnake Roundup. Terry was understandably overwrought and less than congenial. Hopefully tomorrow, at the Jaycee-led rattlesnake hunt, we’ll meet under more favorable circumstances. 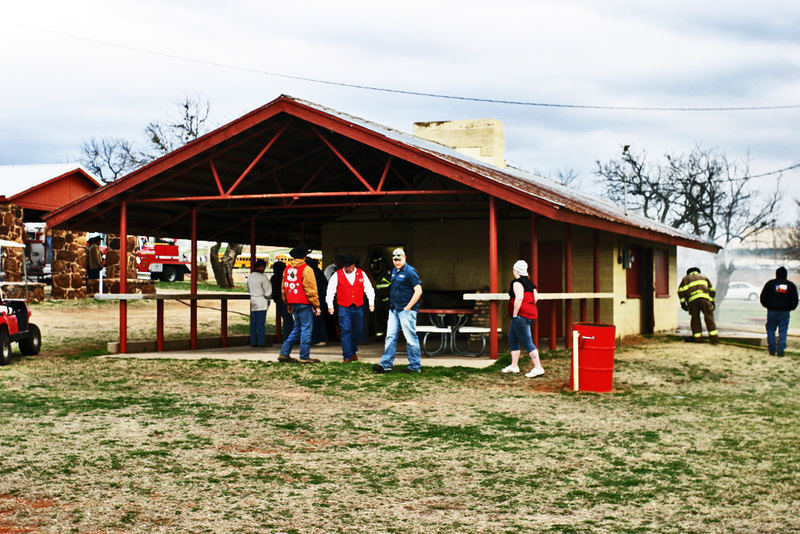 The Jaycee’s CookShack, located at the southeast corner of the Nolan County Camp Grounds, was set on fire from, of all things, a burning porta-potty. Four porta-potties had been delivered a few minutes before the fire, and someone evidently entered one and set the roll of toilet tissue in it on fire. The epoxy-plastic housing of the portapotty quickly became a roaring inferno, catching the other three portapotties on fire with it, and ultimately spreading to the structure of the cook shack as well. The Sweetwater Fire Department was called, and on arrival had the fire extinguished quickly. In the photo at left, smoke can be seen emanating from the opposite end of the structure, where the portapotties were located. I did not ph0tograph the actual fire itself. A melted portapotty is not a pretty sight. Trust me on this. Whenever the Jaycees sponsor something, anywhere, I have to support it. In the early 1970’s, while working as a field systems analyst for Texas Instruments at their Atlanta, Georgia, office, I joined the Atlanta Jaycees. Their work in the Atlanta area was inspiring to a young fellow like me (yes, I was once young, back then, that is), and when — in 1977 — T.I. reassigned me to a post in Austin, my Jaycee membership was transferred to that city. That was the most memorable time of all, as I got to work alongside some of the most vigorous up-and-coming businessmen that Austin has ever seen. It was also my last year with the Jaycees. How sobering to suddenly be “too old.” Back then, you could only serve in the Jaycees through your 35th year of life, and after passing that milestone you were out, in the cold. Literally. You see, back then, there wasn’t any place in the Jaycees for those who were “too old.” I’d have given almost anything to be able to continue back then, but it wasn’t to be, and the loss was very painful. Then, in the 1980’s, things changed. The age limit for membership was increased four years, so members could serve through their 39th year, and another class of membership, the Roosters, was added to enable those too old to be regular members to continue on, as a kind of Jaycees Emeritus. By that time in my life I was far too busy, serving as an EMT and firefighter with a volunteer fire department, and trying to make several companies I’d started up become profitable. Thus, for the time being at least, my involvement with the Jaycees was over. But my heart was, and still is, embedded in that work. The interesting thing about the Roosters is that, at least in the Sweetwater Jaycees, they comprise the greater part of the membership and, to hear them tell it, they do most of the work. I don’t know how true that is, but most of the Jaycees I met at the Sweetwater Rattlesnake Roundup were way past 40. Each was hard at work making the Rattlesnake Roundup work. 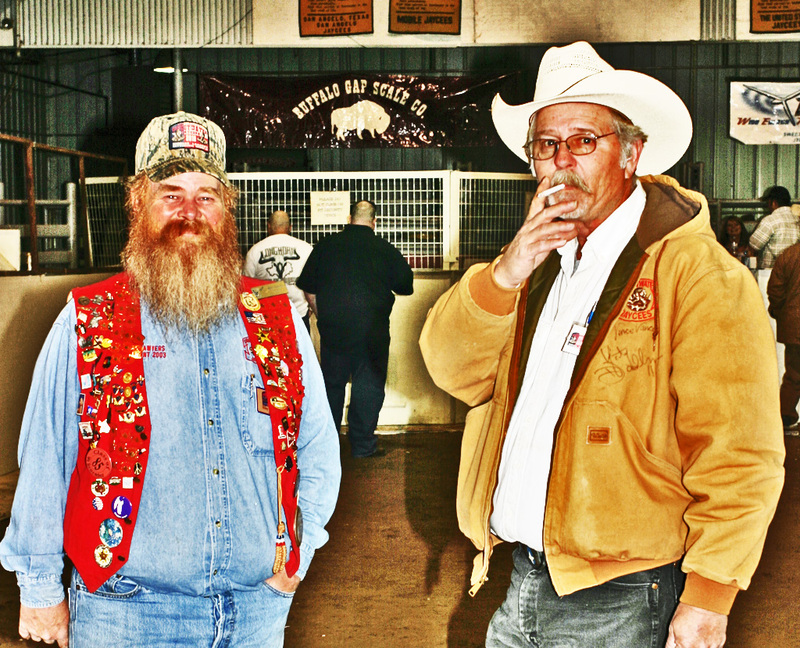 These Good Old Boy Roosters (and Good Old Girl “Roosters” as well, for membership in the Jaycees is open to women, too) come from all over Texas, not just from the local Sweetwater area. The men and women in the Jaycees do an outstanding job in their communities, and — at least in my heart — I am one of their most loyal supporters. When I discovered, some time ago, that the Sweetwater Jaycees hosted this city’s annual Rattlesnake Roundup, there was no doubt in my mind that they were carrying out their work with careful attention to all the issues, both those on the surface and the undercurrents as well. And, in today’s political climate, the under-the-surface issues are daunting. I may cover those issues in more detail later on. In the meantime, though, give thought to these facts: according to the Sweetwater Reporter, each year the Sweetwater Rattlesnake Roundup attracts more than 30,000 visitors from every state in the Union, Canada, Mexico, South and Central America, Europe, and Asia. Tons of rattlesnakes are rounded up by licensed hunters (Texas Game Wardens make sure that only those who hold valid Texas hunting licenses, in all the required categories, collect and sell rattlesnakes to the Jaycees for this event), milked for venom to be used in the production of antivenin and for research to find cures for a variety of diseases, then slaughtered for their meat, parts of their internal organs, their rattles and heads, and their skins. As the legend goes with pigs (“everything but the squeal is put to good use”), nearly everything but the rattlesnake’s hiss is used in some manner to benefit mankind. Whenever an animal, whether a pet dog or cat, or pastured livestock such as goats, horses, or cattle, gets bitten by a rattlesnake, the veterinarian bills usually run into the thousands of dollars. Whenever a human is bitten, that cost often exceeds $150,000 in medical and hospital bills. Yet those costs are only part of the burden that comes with a rattlesnake bite. They pale in comparison with the expenses involved in rehabilitation, or the permanent loss of function in a limb, not to mention the deaths that often result. Clearly, then, the risks associated with the presence of venomous snakes in our environment are far from trivial. Open Wide! Notice how this rattlesnake easily opens its mouth nearly 180 degrees, unfolding its fangs in the process to — under more ordinary circumstances — bite its prey. Over the 52 years since the Rattlesnake Roundup was begun in 1959 one can only guess at the number of rattlesnake bites — which would have been suffered by livestock and humans — that were avoided because of the Rattlesnake-Roundup-mediated-decline in the population of rattlesnakes in the Sweetwater area. Yet, despite this population decline, the number of rattlesnakes rounded up each year has remained relatively steady. In fact, the number of rattlesnakes rounded up for the 2010 event is expected to be at least as great as last year, arguing forcefully against the oft-made accusation that such roundups threaten the ability of the western diamond-back rattlesnake to maintain its place in the local ecosystem. Those 30,000 visitors to the fair city of Sweetwater each year bring lots of cash. Thus the Jaycees make a considerable profit from this annual project. What do they do with all that money? Well, what do Jaycees always do with the money they make? Answer: they donate a huge share to the local fire and police departments, to the Boy Scouts, the Girl Scouts, Youth Baseball, DARE, Hospice, and a host of other important service providers and charities. March 12, 2010–The Sweetwater Rattlesnake Roundup snake hunt. The Nolan County Coliseum opened this morning at 8:00 AM sharp. Those who came to attend the guided snake hunt went to the back of the coliseum to register. There two Texas game wardens watched as each registrant either showed their existing hunting licenses and non-game dealer licenses (form 548), or bought new ones. Once registered, we were free to wander the coliseum, taking in the sights and watching the numerous demonstrations of snake lore on the floor of the center, until the hunt was officially called. We were told that would take place around 10 A.M. or so, which was about an hour and a half later. One of the vendor booths that caught my eye was selling snake heads in Ball Canning jars of 70% alcohol. Large snake heads were in 16 oz. jars, priced at $12.00 each, and smaller heads were in 12 oz. jars, for $10.00 each. On the wall behind the table, a line of of tanned rattlesnake skins were tacked up. As you can see, the variety and number of different kinds of rattlesnake-related memorabilia being sold at this booth was staggering. Included were keychains with stuffed rattlesnake heads or rattlesnake rattles attached, rattlesnake hide watchbands, luggage tags, billfolds, purses, photograph holders, belts, and just about anything a person could make out of rattlesnake hide. 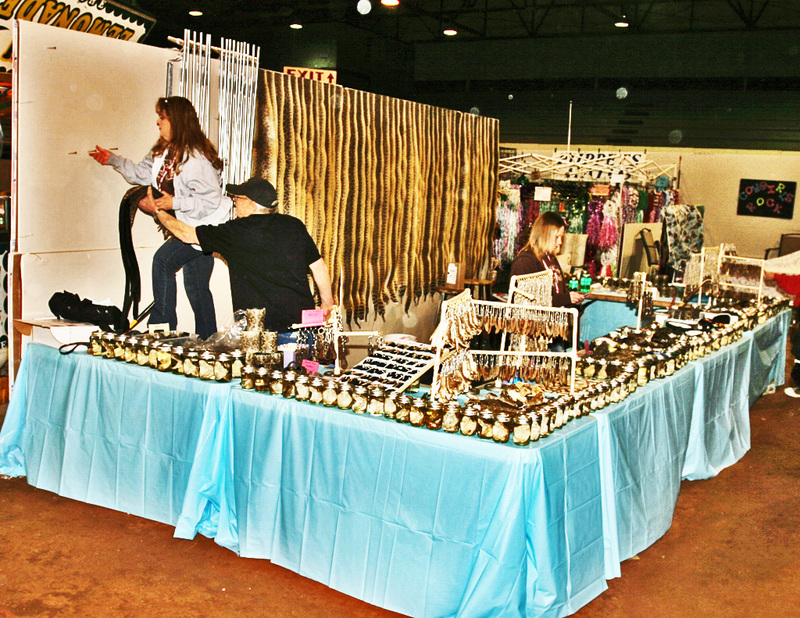 For those who want to tan their own rattlesnake hides, bottles of tanning solution were also for sale. These bottles, contining an aqua-colored liquid, came with a page of tanning instructions, complete with drawings depicting precisely how to carry out the otherwise esoteric procedure. All those articles made out of rattlesnake hide don’t leave much 0ut, methinks. If you had wondered, earlier, how on earth a rattlesnake could possibly be used for very many useful things, a careful examination of booths like this one soon put such questions to rest. Are they practical? You be the judge. One of the two ladies manning the booth posed for me, flashing a pretty smile. 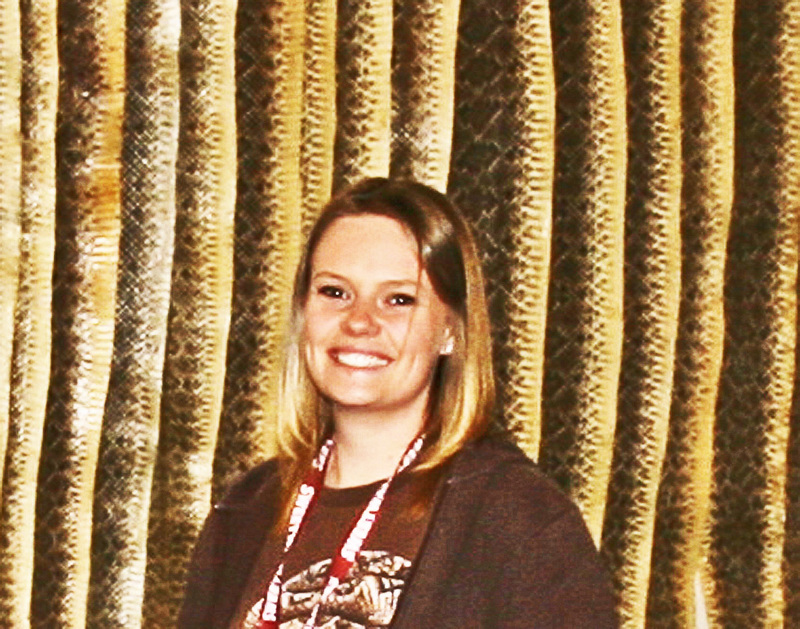 Behind her, the tanned rattlesnake hides made for an interesting backdrop. Some may wonder how such extraordinary beauty can be closely associated — as it is in this photograph — with the fearsome nature of a western diamond-backed rattlesnake. Well, here it is, and the two pair quite well, as you can plainly see. Those in the know recognize how important women were — and still are today — to the taming and maintaining of a west Texas ranch and household. It’s a good guess that behind that pretty smile is a tough, determined Texas woman who knows exactly what “Don’t Mess With Texas” really means, and who probably would add a “And — If You Know What’s Good for You — You Won’t Mess with Me, Either! ” caveat to that terse and pithy saying. At the southeast corner of the coliseum several snake experts were carrying on a series of safe-handling demonstrations for school-children and adults who were interested. 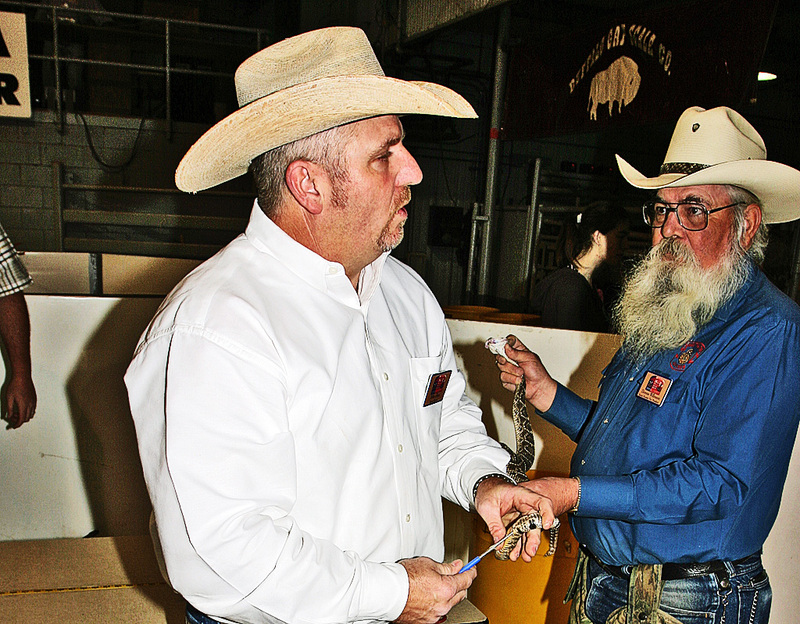 In the photo at left, the gentleman in the black western hat, holding the rattlesnake in the right center of the photo, is Terry Armstrong, president of the Sweetwater Jaycees. Terry, who is a volunteer firefighter with the Roscoe VFD — his brother Gary is the Chief — is holding the rattlesnake (which is probably as long as he is tall) by the head, his thumb and middle finger on each side of the jaws, and his forefinger on top of the snake’s crown. The snake cannot bite Terry’s right hand while he holds it this way, but such a large snake is difficult to hold very long without risking muscle cramps, as the snake constantly pushes against the hand, trying to get free. Terry has been handling rattlesnakes for some time, so he knows how long he can safely grip the snake without growing tired. Rattlesnakes this large are not uncommon in the Sweetwater area, and all over this portion of west Texas. That they are able to grow this large in only a few years of life testifies to the huge population of prey animals that these snakes feed on, throughout their active range. The primary prey of the western diamond-backed rattlesnake is the small mammal, including shrews, pygmy mice, voles, house mice, small rats, larger wood rats, cottontail rabbits, and rock squirrels. Juvenile rattlesnakes feed mostly on the smaller of these animals, while the larger snakes feed on more hefty, quick footed prey. All of these animals are opportunistic vegetarians capable of pillaging — not to mention simultaneously contaminating them with their feces — mankind’s seed bins, vegetable gardens, and granaries. The economic damage such pillaging produces is staggering, so we rightfully thank all the snakes in all of our ecosystems throughout the world where snakes are found for their public service activities that keep rodent populations in check. 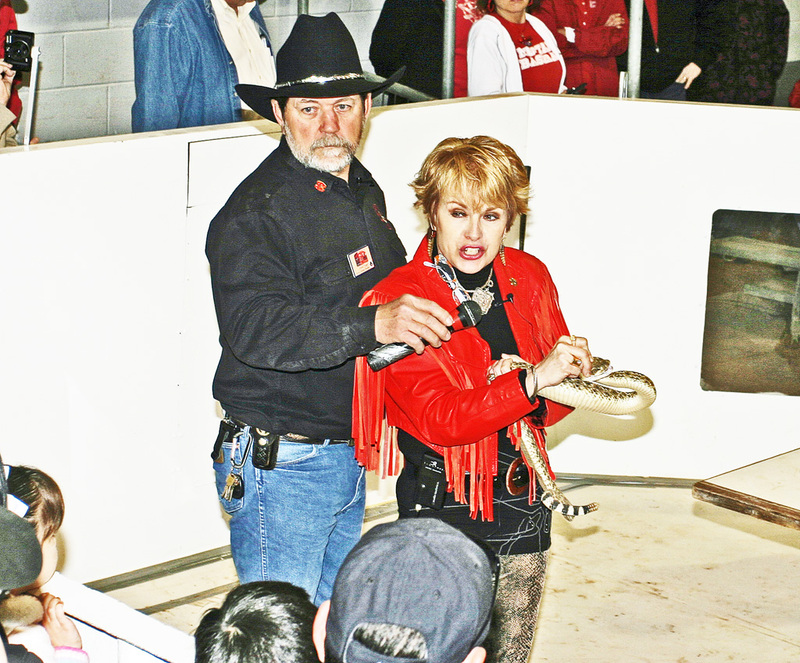 In the same pit with Terry Armstrong, a pretty young lady — who just happens to be an elected legislative member of the Texas House of Representatives — was also demonstrating how to safely handle rattlesnakes. She is in her second term of office, and travels throughout west Texas, as a public service, teaching how to handle rattlesnakes without getting bit. Part of her presentation includes instruction on how to safely travel in the Texas wilderness, where venomous snakes abound, avoiding injury in the process. Obviously, though dangerous, without the presence of numerous diamond-backed rattlesnakes feeding on them, rodent populations of all kinds would quickly increase to the point of being out of control. However, western diamond-backed rattlesnakes are only one species of snake that feeds on such rodents. An even more efficient predator of rodents is the rat snake, in the genus Elaphe (and in other genera, as well). In Texas, five species and subspecies of rat snakes in the genus Elaphe, alone, are represented. But it isn’t just the ratsnakes that, besides rattlers, feed on rodents. Of the 94 species and subspecies of non-venomous snakes found in Texas, the vast majority are opportunistic rodent predators. That helps explain why Lawrence Klauber, the preeminent expert on U.S. rattlesnakes before his death in 1968 at the age of 84, plainly asserted that rattlesnakes do not occupy an ophidian niche that cannot be filled by non-venomous snakes. Klauber was quick to point out that those non-venomous species of snakes are at least as effective at keeping rodents in check, yet are much less risky to humans, than are rattlesnakes. Klauber made it clear that he believed that rattlesnakes should not be protected when found in areas close to human habitation. — Questions? Corrections? Comments? Feel free to e-mail jerry.cates@entomobiotics.com. You may also leave a detailed comment in the space provided below.